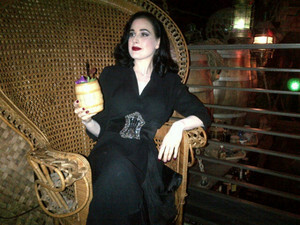 Dita at Smuggler’s Cove. Photo from Murray Hill’s tweet. Happy to score a few ~Dita Von Teese~ sightings after losing my mind over her show at The Fillmore last Tuesday. I stopped in at Dosa on Fillmore for a post-show bite (hello vada pav), and learned she came in for a pre-show meal (and had a Bombay Smash cocktail). Damn, why didn’t I eat early? And after the show, according to these tweets, she enjoyed some cocktails at Smuggler’s Cove with the cast. Meow. Lastly, this isn’t a restaurant sighting, but a friend tells me she was also spotted at the de Young Museum revisiting the Gaultier show (the entire cast of Strip Strip Hooray was invited).